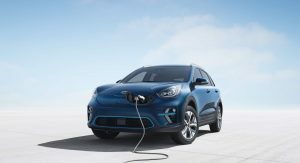 The Kia Soul EV wasn’t the only electric vehicle to bow in Los Angeles as the automaker also staged the North American debut of the 2019 Niro EV. 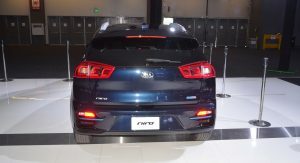 Looking largely identical to the standard model, the electric variant is distinguished by an enclosed grille which features an integrated charging port. 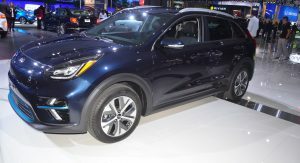 The crossover also has “Arrowhead” LED daytime running lights, revised side skirts and aerodynamic 17-inch alloy wheels. 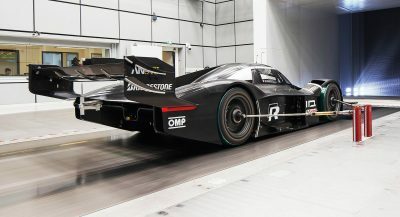 Motivation is provided by a 64 kWh lithium-ion battery pack which is mounted underneath the floor. It sends power to an electric motor that develops 201 hp (150 kW / 203 PS) and 291 lb-ft (395 Nm) of torque. 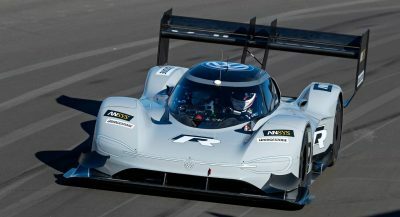 This enables the model to accelerate from 0-62 mph (0-100 km/h) in 7.2 seconds before hitting a top speed of nearly 104 mph (167 km/h). 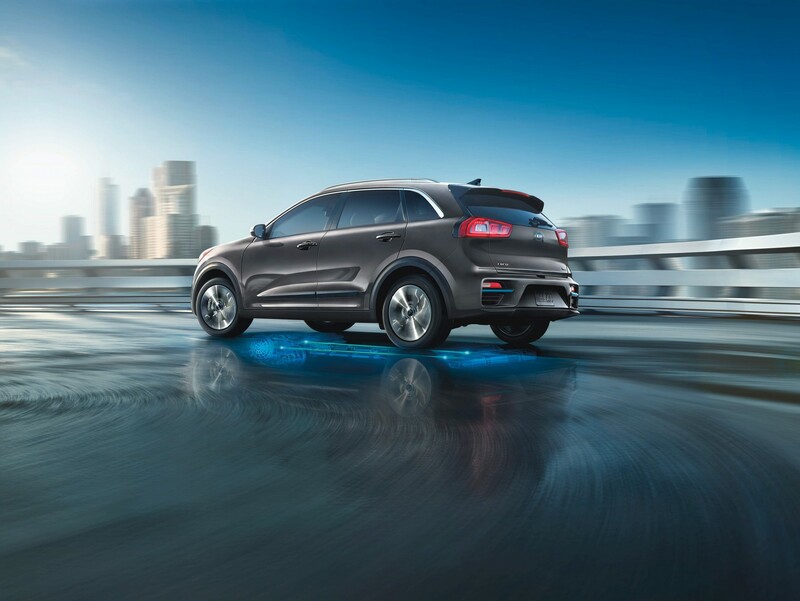 Of course, the Niro’s most important specification is its 239 miles (384 km) range. 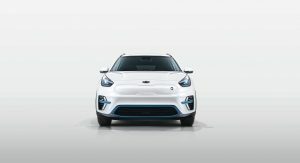 This numbers bests the Chevrolet Bolt by 1 mile (1.6 km), but is 19 miles (30.5 km) less than the Hyundai Kona Electric. 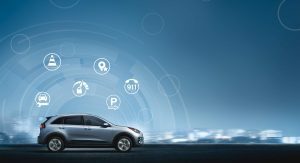 When it comes time to recharge the battery, owners will need approximately 59 hours with a Level 1 charger featuring a 120 volt connection. Since most drivers don’t want to wait over two days, owners can also use a 7.2 kW Level 2 charger that reduces the time to 9 hours and 35 minutes. 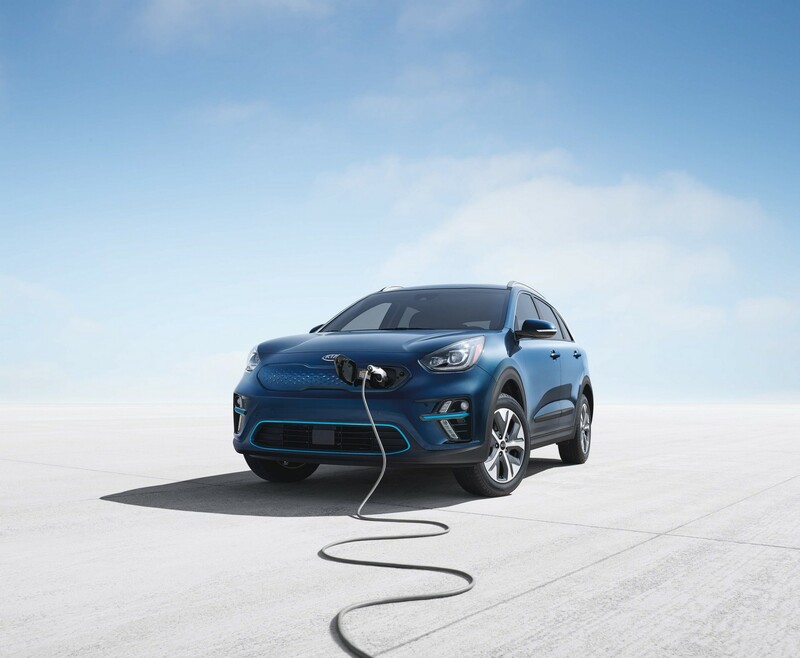 Drivers with even less time can use a DC fast-charger to give the Niro approximately 100 miles (161 km) of range in 30 minutes. After 75 minutes, the car can be given an 80 percent charge. 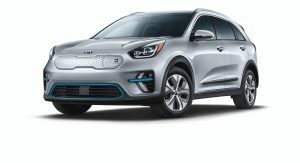 Kia didn’t mention pricing, but confirmed there will be two versions of the Niro EV in America. 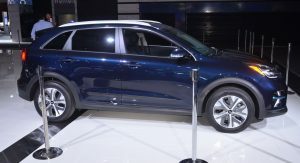 The entry-level EX variant comes equipped with leather and cloth seats, a four-speaker audio system and an automatic climate control system. 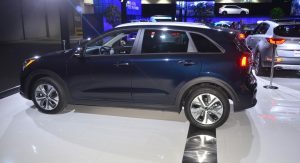 The model also has heated front seats, a wireless smartphone charger and a 7-inch touchscreen infotainment system. Moving up to the EX Premium rewards buyers with LED headlights, a power moonroof and an auto-dimming rearview with HomeLink. Buyers will also find heated / ventilated front seats, a heated steering wheel and an 8-inch infotainment system with GPS navigation. 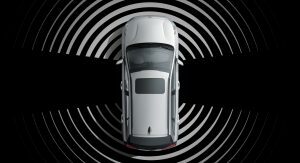 Both models also come standard with an assortment of driver assistance systems including forward collision warning, forward collision-avoidance assist, and lane departure warning. 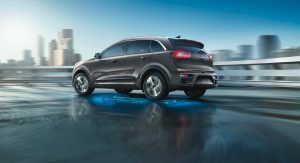 Other features include lane keeping assist, rear cross-traffic alert and smart cruise control with stop and go. 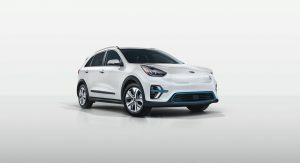 Can’t understand why the Niro EV, which is a dedicated environment-friendly offering, has less range than the Kona EV. 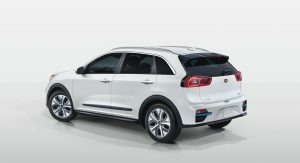 And how will Kia differentiate this from the Soul EV? Niro is bigger than Kona. It’s larger (by 7.5 inches) and heavier than the Kona (and Bolt). 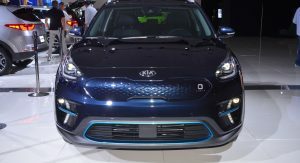 Plus, the Niro isn’t on a dedicated EV platform, as its design had to incorporate ICE for the hybrid and PHEV. 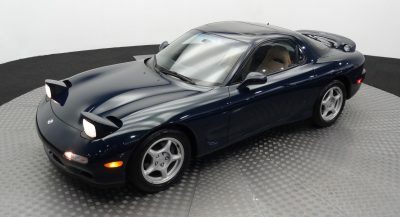 If other automakers had half a brain, they would be developing competitors to this. 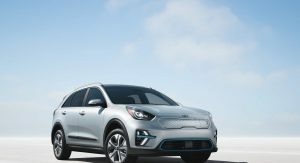 Electric, affordable, small-to-midsize crossovers are the future of volume sales. 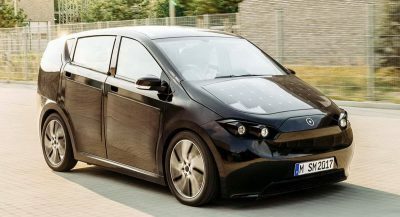 As much as I like sedans, I am surprised that up until now, most electric cars have been…cars. Even Tesla brought the “affordable” Model 3 to market as a sedan. Sure, aero would be better in a sleeker, lower car, but this can be overcome somewhat by better design and height adjustable suspension. 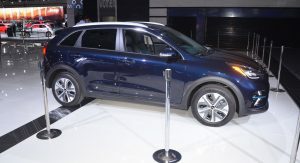 Besides, crossovers sell, even if they sacrifice efficiency for utility and trendiness. I wear a condom so I don’t have unplanned children and then have to get an ugly gas guzzling crossover to shlep them around in. 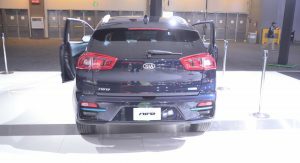 The Niro is larger (and heavier) than the Kona and Bolt (by 7.5 inches).